Whispering City (1947) and I Confess (1953) are two similar films that are shot in Quebec City. They share visual and aural elements in the film noir genre. Here I will compare the two films paying attention to its important location and it’s visual style. The two directors Fedor Ozep and Alfred Hitchcock share a similar resume in their film careers. Both filmmakers emigrated from Europe before coming to Hollywood. In Quebec and Canada, Ozep is best-known as the "Hollywood" filmmaker imported to Quebec in order to direct three of the first sound features produced in the province: Le Pere Chopin (1944), La Forteresse (1947) and its English-language counterpart, Whispering City. Yet before his arrival in Quebec, Ozep was lurking in the shadows of many of the great early Eastern and Western European national cinema movements, making films in the USSR, Germany, Italy, the UK, Spain and France, before relocating to Hollywood, and then Quebec. His invisibility in film history is aided not only by near-continuous immigration, but also by the plethora of spellings of his name: in Russia and the USSR, Fyodor Otsep, Fyodor Otzep, and Fjodor Otsep, in Western Europe and North America, Fedor Ozep; in Spain, Pedro Otzoup. Ozep's career ended with a noir film (Whispering City), the genre that, above all others, exemplifies the hybridization of European cinematic styles in a recognizably American form. Hitchcock however, did not immigrate as much as Ozep did. Hitchcock was a direct import to Hollywood from the UK. However while in Europe Hitchcock did have the opportunity to be influenced by German Expressionism, which is more apparent in his early work including I Confess. Whispering City opens with various shots of Quebec City; a bird’s eye view of popular tourist attractions over the credits. 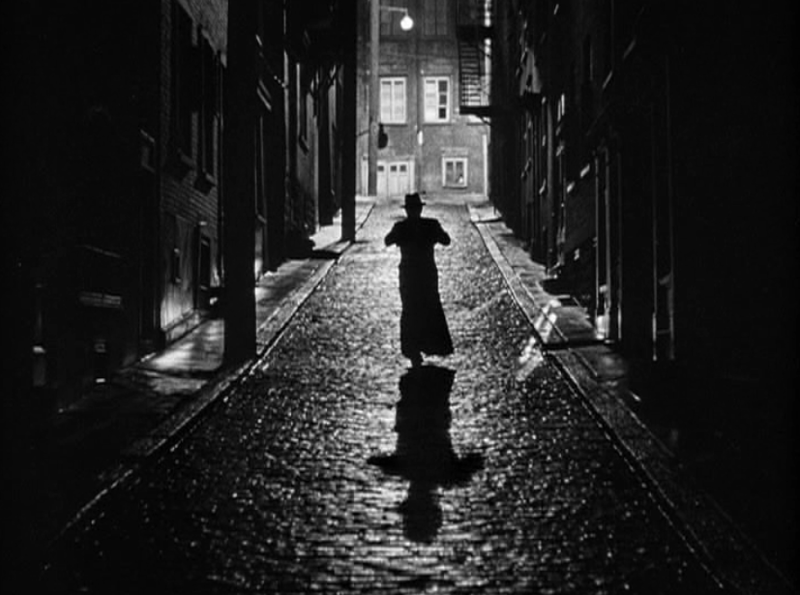 (A method often employed by Hitchcock) Then a sleigh driver begins to tells a story to his passengers, essentially introducing the film’s main characters; a typical film noir method of recalling past events at the beginning of a film. When he talks about the reporter Mary Roberts we immediately dive into the story. While on the phone she reiterates that there has been an accident. At the word “accident” the dramatic music starts, and this in turn creates an air of mystery. The same music comes back when the reporter is interviewing Rene Brancoeur on her deathbed. 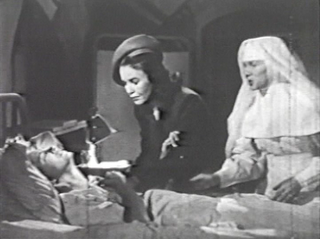 The dramatic music is cu ed in when Rene says: “It wasn’t an accident… he was killed.” The opening of I Confess uses the exact same method to create an atmosphere of mystery. The credits roll over a slow boat tracking shot getting closer to Chateau Frontenac under a gloomy sky. 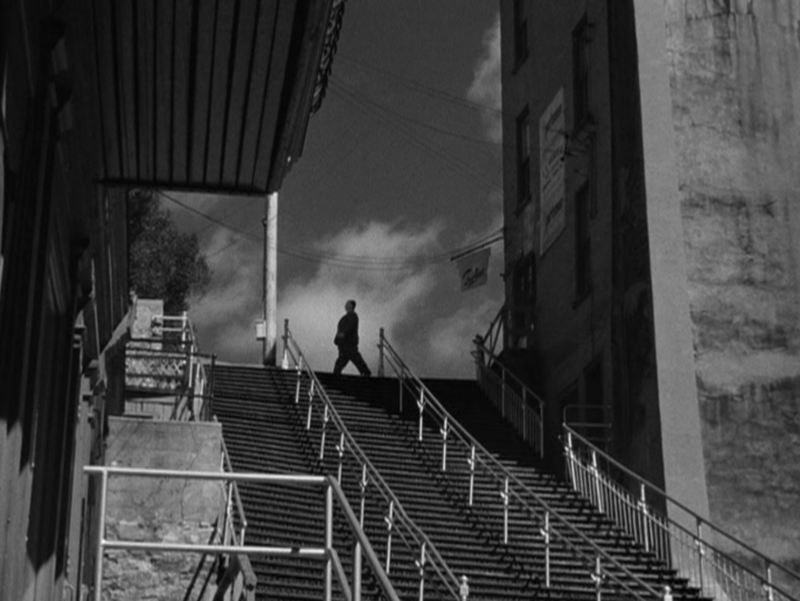 After the infamous credit “Directed by Alfred Hitchcock”, we then see various shots of Quebec city, all of them locations used in Whispering City. 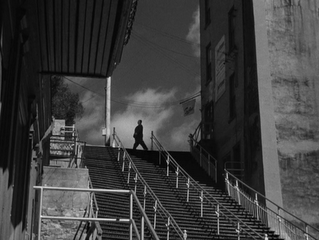 Alfred Hitchcock’s cameo is atop of a staircase in which Michel from Whispering City will go down. We then see the same archway as the opening of Whispering City. The soundtrack intensifies when the camera tracks through a window and sees Villette dead in his house. 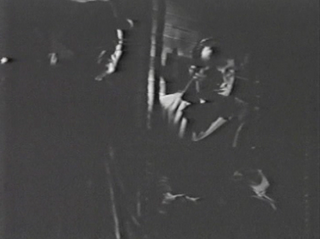 Both films use film noir motifs in their visual style such as strong directional lighting, and deep shadows. For example in Whispering City when Michel arrives at Frederik’s house drunk they are in his study. There are no lights on; we only have the light coming from the moon through the windows. This creates strong shadows on their faces, covering half of them in darkness. This suggests that our character has a dark past and is not being honest. There is a similar shot later in the film when Michel is in hiding in the recording studio, listening to the orchestra. Another double meaning conversation in the same film is when Paul Duval and Mary Roberts are about to go for a drive to Montmorency Falls. Before they leave the hotel he needs to make a phone call. Mary asks “Oh, is it about a job?” Paul replies “Yes… its… about a job.” The audience knows that the job is her elimination. 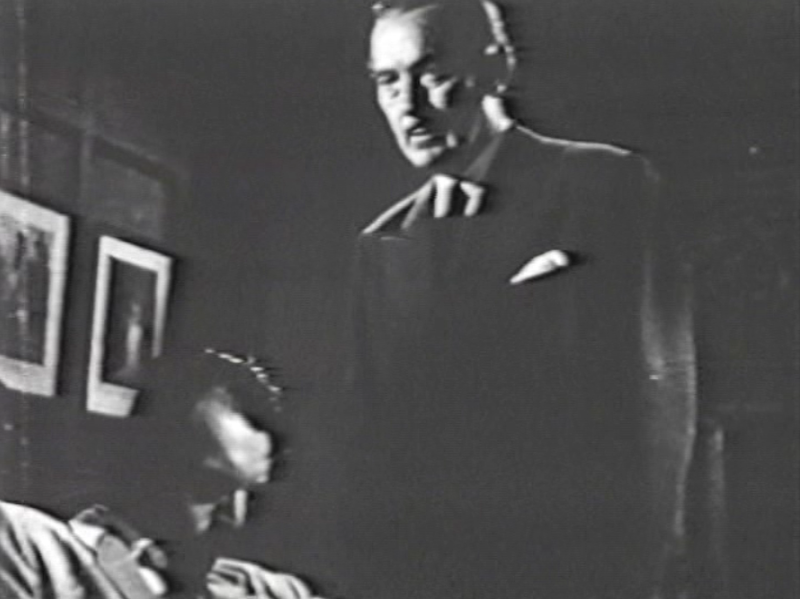 Whispering City uses the double identity device when Michel Lacoste must use another name in order to murder Mary Roberts. He goes under the name of Paul Duval. It is at this point in the film that he must contemplate if he will give in to Frederick’s demands. He walks the streets of Quebec similar to when the priest does in I Confess. He goes down a long stairway, symbolic of where his life is heading (downhill). The days past events replay in his head, tormenting him. In one shot he walks past judges in the street, and there are a pair of nuns walking behind him. This visual clue suggests that he is being judged from all angles of his life. The use of shadows is apparent in both films. When Michel Lacoste / Paul Duval decides that he will murder Mary Roberts the first thing we see when he approached her apartment door is his shadow. This is a direct influence from German Expressionism and The Cabinet of Dr. Caligari. (1920) By showing the shadow this suggests that he will be going through with the murder because shadows do not show any human emotion. We cannot tell if he is nervous, or regretful of what he is about to do. A shadow gives no hint of remorse or fear. 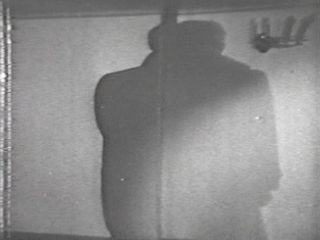 Hitchcock also uses shadows in I Confess. After Otto kills Villette there is a shot of his shadow along a wall outside. His face is covered in darkness for a few moments. In both films however after the shadow has exited frame right we see the nervousness of both characters. One who is about to commit murder, and one who has just done it. 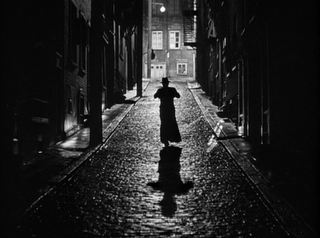 The dark alley is another film noir device used in both films. The dark alley is a place of danger and uncertainty and creates a sense of suspense and is always a place in which shadows lurk. In Whispering City Mary goes to Rene Brancoeur apartment after getting a mysterious key. However to get there she must go through a dark alley. 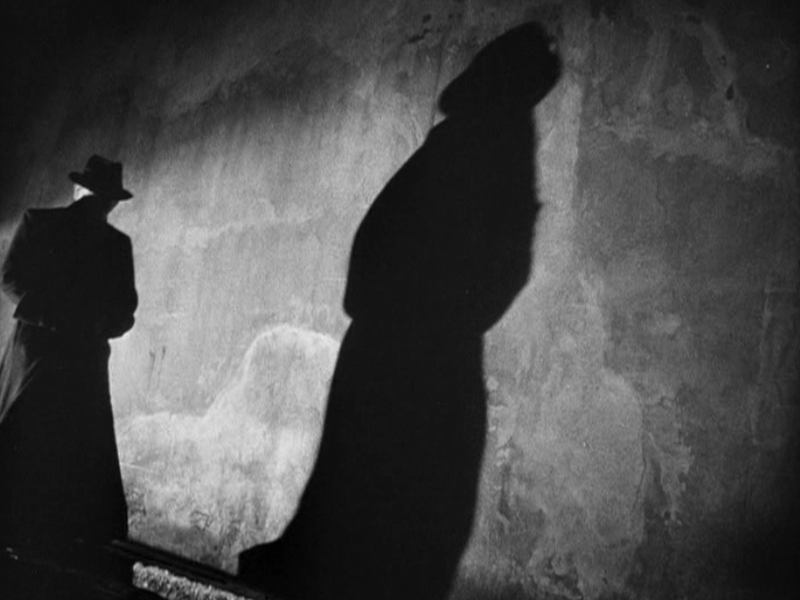 In I Confess the murderer is seen walking down a dark alley with his long shadow in front of him. Whispering City to me seems more influenced by German Expressionism than I Confess. Ozep seemed influenced by Joseph Von Sternberg’s cinema. The frame was very full of props with a lot of depth of field. Like in The Blue Angel (1930) As we can see by these two pictures Ozep had a lot happening in his frame, reminiscent of Von Sternberg. 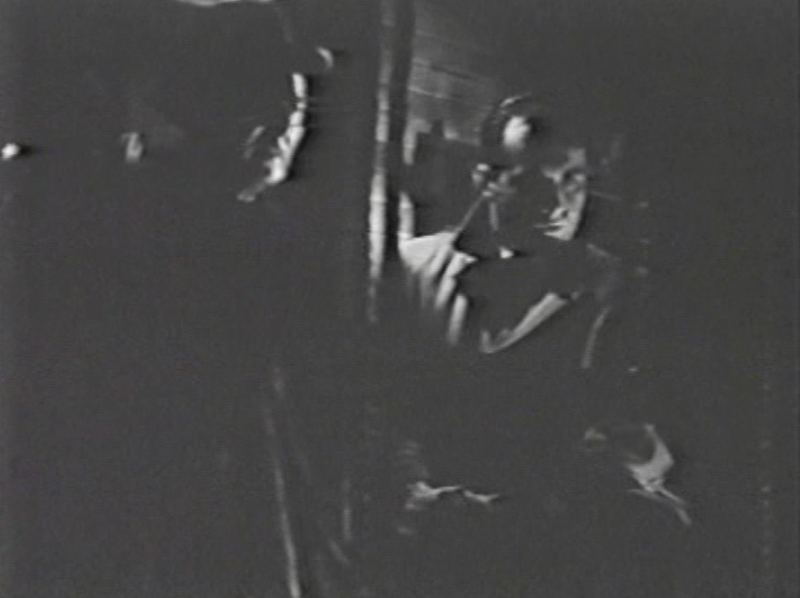 Both film’s end with the crazy killers confessions, with an exchange of gun-fire. Even though Hitchcock had to alter the ending of I Confess to please the sensors, Hitchcock’s film has a much stronger ending than Ozep’s. Ozep’s film starts with a story being told, you almost think that this man will be our narrator. However we never see him again. The end just shows his sleigh riding off in the snow. To me this character was there because Ozep did not know how to open his film and introduce his characters in a creative way. Whispering City is often accused of not telling an authentic local narrative, however I Confess is in the same boat. Of the two films being discussed I Confess would be the more authentic in relation to its location of the two. For example in Whispering City we do not hear anybody speak French. In I Confess, it is heard often. For example the priest Michael Logan says “bonne journee” to an alter boy. Ruth speaks French to her maid and tells her to go to bed and that she will clean the mess. We see more of Quebec in Whispering City than I Confess. Montmorency Falls is a location that I Confess does not show. The film also mentions location names more. “I’m at the Chateau apartments on Grand Allee” and “Hotel Dieux” is not something we will hear in I Confess. Locations are more generic in I Confess; for Example, “the church”, “Villette’s place”… And on a cultural level characters smoked a lot in Whispering City, whereas in I Confess nobody smoked! Everybody knows that Quebecers are chain smokers! Also in I Confess Quebecers activities where not discussed at all. In Whispering City at the restaurant Mary and Frederick discuss Quebec’s great ski hills. Also the symphony Michel was working on was called the “Quebec Concerto” The only cultural reference in Hitchcock’s film is when Michel roams the streets of Quebec he looks at a poster for the Bogart film called The Enforcer, a Hollywood production! Although Ozep did not reach the level of cinematic canonization that Hitchcock has achieved, I believe Whispering City is a strong film in the history of Canadian cinema and should be considered an important piece in the history of film noir. Wow! Quelle surprise de trouver une étude comparative de deux films que j'affectionne particulièrement, dont un qui, ma foi, est largement inconnu du public, voir des cinéphiles : Whispering City. Je suis d'ailleurs très certainement parmi les seuls au monde à connaître certaines répliques par coeur! 1) un aspect intéressant de Whispering City est certainement le fait que la version française ait été entièrement tournée avec des comédiens francophnes, plutôt que d'être simplement doublée. Chacune des scènes du film a donc été tournée deux fois par Ozep. Et il importe de préciser que la prestation des acteurs canadiens français n'est certainement pas en-deça de celle de leurs vis-à-vis américains. 2) Lorsque vous mentionnez les références à la culture locale plus nombreuses dans Whispering City que dans I Confess, vous précisez que l'oeuvre jouée s'appelle le Quebec Concerto. On peut ajouter qu'il s'agit en plus d'une oeuvre du grand compositeur André Matthieu, d'ailleurs encore interprétée aujourd'hui par de grands orchestres symphoniques. 3) Enfin, il peut être utile de préciser aux amateurs internationaux de I Confess que le film de Robert Lepage, Le Confessionnal, est d'une certaine façon un hommage à l'oeuvre originale de Hitchcock. Merci encore pour cette lecture fort intéressante. Merci pour vos commentaires et je savait pas que l'orchestre jouait une pièce Québécois! Très intéressant!